Available in a wide variety of printable surfaces for a professional look. Compatible with most inkjet & thermal printers, Rimage Everest, & Teac P55. As well as unbranded, shiny silver surface. 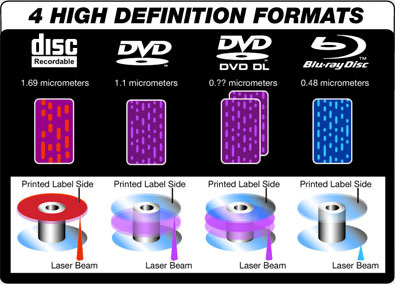 The key technology behind the Blu-ray disc is the blue laser, which has a wavelength of only 405nm (billionths of a meter). DVDs use a pure red laser with a wavelength of 650nm, and CDs use a 780nm wavelength infra-red laser. The benefit of having a blue laser with a shorter wavelength means it is possible to write smaller data pits, and significantly increase the amount of data stored on a disc. Microboards Technology unveiled the G3 Disc Publisher this month. The latest innovation in a long line of award-winning disc publishing products by Microboards. The enhanced G3 is to be positioned as a professional entry-level all-in-one desktop publisher. Microboards executives believe the G3 is the final piece to the puzzle in its three-tier line of disc publishers. 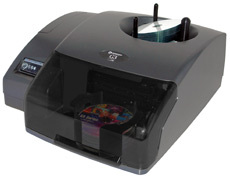 The G3 Disc Publisher is also available as a print-only system, the G3 Auto Printer, giving small businesses, home offices, and other organizations a solid option for short runs of CDs, DVDs, or Blu-ray Discs. The CX Series is well-established as the mid-range line, known for its outstanding print quality, while the MX Series is popular for its low-cost, high-volume output. The G3 Disc Publisher and G3 Auto Printer are expected to street-price at $1495 and $1095, respectively. The Publisher will be packaged with Microboards’ own PrintWrite publishing software with versions for both the PC and Mac. Also included is SureThing label design software for PC, USB 2.0 cable, and a starter kit including blank media and GX-300-HC HP tri-color ink cartridge. The broad offering that Microboards brings to its optical users is split into two core components—hardware and consumables. Microboards is well-known in the optical disc industry for its tower and automated duplicator lines, and Microboards acts as the master U.S. distributor of JVC media, the only Japanese-made disc on the market today. “Our powerful combination of hardware and recordable media provides customers with the best of all worlds,” Pratt stated. A recognized leader in the industry, Microboards Technology has been providing customers with the latest in disc technology since 1989. Offering a broad selection of innovative, cutting-edge products and solutions from both leading manufacturers and its own line of high-quality disc publishing and printing solutions, Microboards is also renowned for superior service and technical support. The company is headquartered in Chanhassen, Minnesota, with a manufacturing facility in Salida, California, and global offices in Japan and the United Kingdom.